Note: Visit the post processor section to specify the post processor for your robot. Furthemore, RoboDK also supports online programming for RC7 and RC8 Denso controllers. This is possible with the default RoboDK driver for Denso. Older or newer versions may be partially supported as well. Note: It is recommended to have Denso’s b-Cap server enabled on the robot side to be able to use the robot driver (online programming). This may be a software option on the robot side. 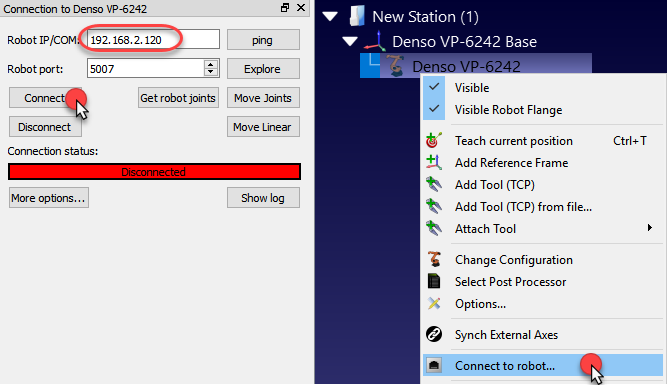 The b-Cap server must be enabled to use Denso’s robot driver (online programming). 1. Switch the robot controller to manual mode. 4. Set the controller’s executable token to Ethernet in the Communications setting menu. This allows starting programs from the computer. Note: b-CAP uses the TCP port 5007 of the controller. Note: Read the previous section to activate the b-Cap server on the robot controller to allow this communication. Use the Run on robot option to move the robot while keeping feedback in RoboDK (Online Programming). This method uses the robot as a server and each instruction is sent to the robot step by step as it is executed in the simulator. This method is useful for debugging purposes. These customizations allow specifying the type of movements or to be able to drive more than one robot at the same time. Any text editor can be used to modify this file. Note: The %APPDATA% folder can reached by typing %APPDATA% on the navigation path. Note: Delete this file and attempt to connect to the robot again to generate the default settings. ● DEFAULT_WORK – Work object used by default (variable string). ● DEFAULT_TOOL – Tool variable used by default. Important: If the linear movements are provided as Cartesian targets the tool should match RoboDK’s Tool definition. ● TOOL_CHANGE_ID – Spare tool variable to use when we set a new tool (5=Tool5 for example). ● MOVE_LINEAR_IN_JOINTS – Set to false to provide linear movements as Cartesian targets. ● MOVEJ_CMD – Command to send for a Joint Movement (MoveJ). The following table provides the allowed options. ● MOVEL_CMD - Command to send for a Linear Movement (MoveL). The following table provides the allowed options. Important: One @ character should appear twice in the INI file. The @ sign means that the movement will be rounded. Important: The %1 sign in the INI represents the location of the joint values or cartesian information. ● ROBOT_OPTIONS – Robot options to get the robot resources. For example, if we are using the slave robot of the controller we must specify ROBOT_OPTIONS=”ID=1”. ID must be 0 (default) if we want to use the master robot (main robot). ● SHOW_JOINTS_FEEDBACK – Set to true to see the robot feedback on the screen in real time (performance can be slower). 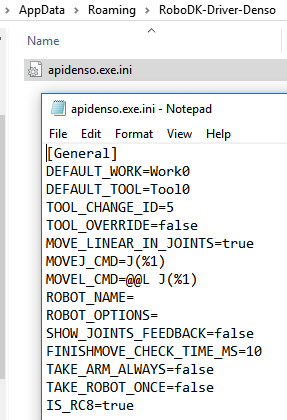 ● FINISH_MOVE_CHECK_MS – Set how fast the robot position should be refreshed on the screen when showing the joints feedback. ● TAKE_ARMS_ALWAYS – Set to true to keep the controller resources after each movement until the robot is disconnected (faster but it may lead to unexpected results). ● TAKE_ROBOT_ONCE – Set to true to keep the robot resource after each movement while the robot is connected (faster but it may lead to unexpected results). ● IS_RC8 – Set to false to properly connect to RC7 and older Denso controllers. Note: Once the file is changed. Double click Disconnect and select Connect again to take the new changes. The following image shows the default values. Tip: The default Denso driver is located in: C:/RoboDK/api/Robot/apidenso.exe. Create a copy of this file with a different name in the same folder to support two or more robots connected at the same time. A new INI file will be created and we can specify separate settings.